When you hear “wave maker,” you’re likely picturing that pool with simulated waves at the water park? You’re not far off, because an aquarium wave maker does make waves, just on a much smaller scale. As a novice aquarium owner, I remember being overwhelmed by the available accessories. There’s a whole other world beyond the basics like your tank, substrate, and filter. And some of these extras can be downright baffling if you’ve never heard of them before. You might be wondering why you might need an aquarium wave maker? What does one do? How can having the best aquarium wave maker benefit my aquarium? And, crucially, how do I go about selecting one? We’re going to cover everything you should know about them in this guide. You’ll learn about the most important features to look out for when you shop, the pros and cons of using them, what to look for when shopping for one and much more besides. We’ve also looked at a shortlist of some of the top models available on the market today. What is a Wave Maker? What Does it Do? What Does a Wave Maker Bring to an Aquarium? What’s the Difference Between a Wave Maker and Powerhead? What Size Wave Maker do You Need? 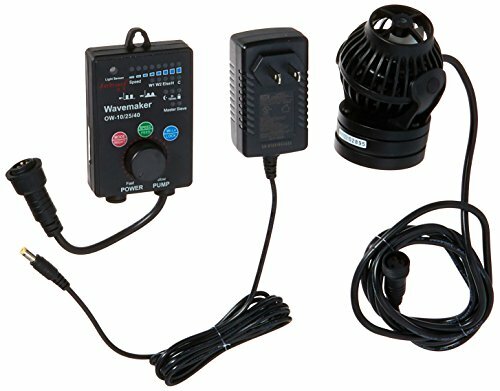 Where to Place a Wavemaker in an Aquarium? How Big is Your Aquarium and What lives There? How does it Fit on or Mount to Your Tank? As we’ve established, an aquarium wavemaker produces waves in your aquarium. These waves mimic the waves that occur in natural bodies of fresh water and salt water. Of course, this is limited to waves under regular conditions, we’re not talking about tsunamis. Wave makers are not supposed to stress your fish out. A good wave maker gives you options to tailor the strength and pattern of waves. For example, smooth waves, rolling waves, and turbulent waves. This is important, as natural wave patterns are distinctive, depending on the body of water. So, the waves in a freshwater river are not the same as sea waves. Different parts of the ocean can have calm, soothing waves or volatile currents. Currents are not the same during the day as they are at night. A wave maker allows you, the aquarium owner, to mimic some of these conditions. Barring decorative items like castles or plastic scuba divers, every aquarium accessory shares the same purpose. That is to improve the conditions in your aquarium for the life inside it. Most natural bodies of water are in near-constant movement. Even if this isn’t visible on the surface, the water is never still. Water movement is important to the overall health of your fish, who need mental and physical stimulation like any living creature. This is why we don’t leave our fish in a bare aquarium tank. Everything inside your aquarium, from the substrate to your plants, grants your fish an opportunity to practice natural behaviors. A wave maker provides resistance in the water, which is great for exercise. The more your fish swim around, the better. Swimming promotes development, muscle growth, and reduced in aggression in most species of fish. It can also give your fish a fresh perspective of your tank. After all, no matter how large your aquarium is, it’s still a confined environment. Things can get dull after a while, particularly in smaller tanks. Swimming through moving water is more engaging than still water. Fish can choose to swim against the current or drift with it. Other fish use the movement of waves to help them forage for food. Certain species of predator fish use waves to their advantage when hunting. Depending on what sort of fish you have, a wave maker might be a necessity. For instance, Acanthurus Achilles or the Achilles tang needs constant water motion. In the wild, tangs thrive in areas prone to turbulent water movement. If deprived of this, these fish can become stressed and eventually sick. Even if your fish don’t depend on waves for survival, a wave maker can be useful. It can help your fish feel more at home in your aquarium. Ideally, you want your aquarium to be as close as possible to your fish’s natural habitat. If you have invertebrates such as coral in your tank, a wave maker is a must-have accessory. These animals need assistance from their environment when it comes to eating. Polyps emerge from their hard outer skeletons at night to capture creatures that float past, like zooplankton. The water circulation is what brings these nutrients past the corals, giving them a chance to feed. Although polyps can extend a fair distance, their reach is still limited. If your fish generate the only movement in your water, corals can end up starving. In the seas and oceans, waves also improve photosynthesis in corals. In turn, they will grow larger and develop faster. Finally, moving water is better for corals’ respiration and waste elimination processes. The waste that corals produce is carried away so that it doesn’t build up and cause harm. Remember that waves can be found in the habitat of every coral species. They need water movement for survival, not just comfort. In your aquarium, gases like oxygen and carbon dioxide exist in dissolved form. If there is no water movement, these gases will not circulate as well as they should. Wind and waves are responsible for the dissolved oxygen and other gases moving around in natural bodies of water. Oxygen enters your aquarium through the surface of your tank. An aquarium wave maker keeps water circulating, distributing oxygen throughout. Carbon dioxide will also be carried towards the top of your tank. Too much of this gas can be dangerous to fish as well as plants. Well-balanced water chemistry is crucial for maintaining the pH and quality of the water. A wave maker can have a big impact on gas exchange. Think of it as the aquarium equivalent of turning a fan on in a stuffy room. You can breathe, but the air quality isn’t fantastic. For the inhabitants of your tank, water movement can be like a breath of fresh air. A wave maker can work alongside your filtration system to optimize performance. Waste such as uneaten fish food and feces can pile up in your substrate. If the water in your tank is moving, these substances get transported around. Inevitably, this unwanted refuse will pass by your filter. Preventing waste from accumulating is a priority for any aquarium owner. If too much builds up in your substrate, it can be dangerous. The bacteria in your aquarium break down waste, which is a good thing. Unfortunately, hydrogen sulfide is a byproduct of this process. Although harmless in small amounts, in large enough quantities, this gas is fatal to fish and other living creatures. If you spot bubbles rising up from your substrate, you’re seeing hydrogen sulfide. Small pockets of this gas can form and release periodically, which isn’t an issue. However, when hydrogen sulfide accumulates in big amounts, it can be a problem. If the substrate stays undisturbed, this poisonous gas can silently build up. A big enough pocket (or dead spot) can kill all the fish in your tank. A wave maker can help to ensure your substrate won’t be left undisturbed for too long. The movement of the water helps to prevent hydrogen sulfide pockets from accumulating in the first place. A wave maker can even out temperature. In still water, you can experience the temperature equivalent of dead spots. Have you ever been swimming in a lake and come across a freezing pocket of water? That can happen in your aquarium too. Temperature spikes or drops can stress your fish out. It can also lead to the fish avoiding areas of your tank that are too hot or too cold for them. If the water is in constant motion, dead spots won’t happen. 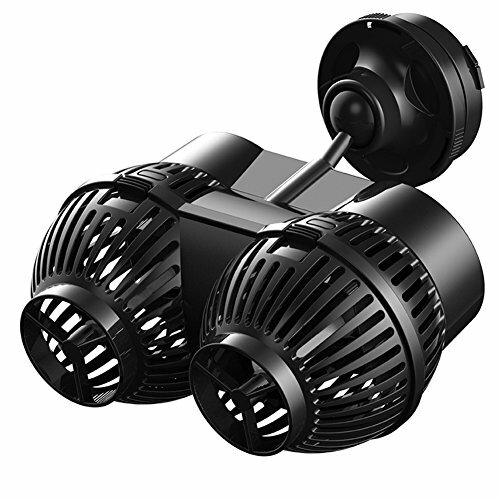 While exploring water motion accessories, you’ve likely come across powerheads. What’s the difference between the two? Why not buy a powerhead instead? Well, if you’re looking for simulated waves, a powerhead simply won’t do the job. These gadgets do keep the water moving, but not in the same way. A powerhead lets off a consistent stream or jet of water into your tank. For fish that need to feel the movement of the waves, a narrow jet of water isn’t enough. A wavemaker, on the other hand, is a system of mechanisms which replicates the currents present in natural water bodies. Aquarium wave makers do have powerheads (known as pumps), but they work differently. You can control the strength and type of the waves issued from the pumps for increased realism. Wave makers include controllers that let you manage almost every facet of water flow. This means you can customize the water movement to meet the needs of your specific species of fish. This isn’t possible with a standard powerhead. They are made up of several parts. These include one or more pumps and a controller (also known as a timer). The pumps are where the “waves” in your tank are made. They work together to create your desired wave strength and type. Some wave makers can work with a single, large pump. Others will have more than one to keep the water movement more varied if desired, or more consistent if not. To work as intended, a wave maker has to cover the whole area of your tank. The controller is what allows you to modify the water movement to suit the needs of your aquarium. This device regulates the duration, strength, and type of waves. Some models have mechanical rather than separate controllers. This just means you will adjust your flow patterns manually on the pump itself. You can adjust these factors as needed. You can choose to replicate natural currents on a schedule to stay as close as possible to the real thing. For example, the quality of the waves will change from day to night as they do in the ocean. To do so, the pumps can work separately from one another. Not all your pumps will operate at the same time in the same way. This design is to promote natural, rather than artificial, water movements. Your fish will appreciate the distinction. Aquarium wave makers can range from simple to advanced models. This means that the capabilities and build of the controller and powerheads can vary. Aquarium wave makers come in many sizes with various flow ratings. There is no “one-size-fits-all” when it comes to these gadgets. Larger powerheads are built for a higher flow rate, meaning water circulation in your tank. You can’t pick the first model you come across without considering how many gallons per hour (GPH) it can circulate. Smaller models are appropriate for tanks that need a slower flow rate. Certain plants and more fragile fish don’t do well in turbulent water. A larger, powerful wave maker is great if you need a higher flow rate. This is suitable for fish that flourish in strong currents. Research what flow rate is ideal for your aquarium’s residents and start from there. Make sure that the wave maker you choose is also compatible with your tank size. The majority of them have explicit size ratings to avoid confusion. Placement is fundamental when it comes to the success of an aquarium wave maker. Don’t forget that the aim is to reproduce natural water flow. If there are places in your aquarium where waves are nonexistent, this won’t work. If your wave maker comes with just one pump, this can be tricky. With many pumps, you can cover more space. When you’re positioning your pumps, you want symmetry. As with other aspects of aquarium care, maintaining balance is essential. If you notice too much or too little motion in one part of your tank, you’ll have to perform some adjustments. Use your common sense too. If your pumps are too low down, you could end up blasting the substrate all over your tank. Little creatures living in your substrate will be overwhelmed by the force of the pumps. Your pumps do not necessarily have to be identical. As long as they’re all compatible you can buy pumps of different sizes. This gives you more flexibility when it comes to placement. If you notice only a small part of your aquarium is a dead zone for motion, adding a small pump could solve the problem. Now you know how wave makers work and you’re ready to get one of your own. But before you invest in one, bear in mind what features you should look out for and your own tank’s specific needs. Below are a few key considerations. To begin with, are you sure that your aquarium needs a wave maker? Not all aquatic life will benefit from water that is always moving. Certain species of plants don’t do well in water with strong currents. They won’t be able to retain enough carbon dioxide to grow well. Not every fish enjoys being highly active. Fish fry and smaller fish can end up stressed and exhausted fighting the current all the time. For other fish, still water is preferable. Take some types of catfish that live in stagnant water as an example—a wave maker won’t be necessary. That said, let’s move on to picking a wave maker that will fit your aquarium. Size rating is one of the first aspects you should check for. If it isn’t designed to work in a tank the same size as yours, there’s no point considering it. Next, take a look at the turnover rate of the wave maker. How often will the water be turning over in your aquarium? Will this rate be appropriate for your fish and other aquatic life? On average, an aquarium volume (all the water in the tank) should be turned around approximately four times an hour. This number can be higher depending on what’s inside your tank. Ensure that the wave maker’s turnover rating is well-matched to your set up. Like most aquarium equipment, wave makers require some effort on your behalf to install. How easy or difficult installation will be is dependent on the model you choose. Obviously, the less time you spend on installation, the better. As wave makers are mounted on the side of your tank, mount style matters. Some mounts are for acrylic tanks only, others are exclusively for glass. Mounts are also rated for tanks of a specific thickness. You don’t want to find out after buying that the mount is incompatible. You won’t be able to set your wave maker up correctly and can damage your tank if you force it. Another factor to bear in mind is the style of mount. Most models are mounted through either suction cups or magnets. As long as they’re built well, magnets tend to be longer lasting. If your suction cups lose suction, it can be a pain to keep the unit mounted. Suction cups can also leave unsightly marks on your tank if you decide to replace or remove your wave maker. Whichever mount you choose, you want one that will stay firm. Wave makers can vibrate strongly when in use—the mount should keep it where it belongs. You want your wave maker’s controller to be straightforward to use and mount. Finding the right flow for your tank initially can take time. Mounting your controller shouldn’t be a laborious process. The same goes for repositioning your pumps around your aquarium. When you’re first setting up, you might need to move your pumps around several times. If they’re difficult to remove and re-attach from your tank walls, you’ll end up frustrated quickly. If your wave maker is controlled manually, factor in your patience. You’ll have to get wet if you want to change the flow or strength. Look for a model that offers multiple settings and functions. This way you’ll be able to mimic natural water conditions more closely. An aquarium wave maker isn’t something that should be replaced frequently. Once you buy one, it should last you for a long time. Always review the quality of the materials used. Pumps should be sturdily built, as should the controller and mount. Buying cheaply will often mean having to repurchase sooner. At this point, you should know that wave makers can be loud. If you already have noisy equipment (such as a CO2 regulator), silence may be a priority for you. considerate of the people you live with. as with most pieces of equipment we use in our aquariums, wave makers can vary significantly in price. Set a budget for yourself and stick to it. There are models to suit diverse types of aquariums as well as budget demands. Don’t overstep and bankrupt yourself. Your aquarium is an ongoing expense; you’ll definitely need that extra cash for something else! A warranty is an extra layer of insurance for you. Wave makers can be expensive and it doesn’t hurt to factor in warranty when it comes to purchasing. Now that you know how wave makers work and what to consider before buying, you’re ready to pick one out for yourself. Below we take a look at the top models available on the market today. This wave maker is sold in separate pieces rather than as a package. Still, this minor inconvenience doesn’t detract from the quality. Of all the wave makers we have reviewed, this model is the most versatile. It gives you precise control over the waves in your aquarium with a range of program choices. 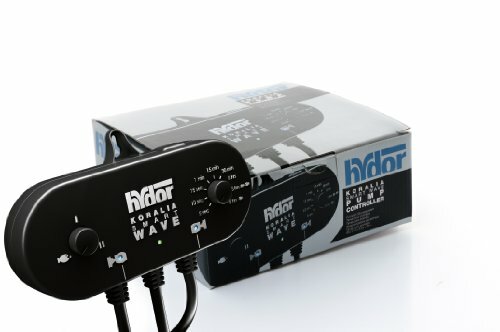 The Hydor Koralia controller is capable of working with multiple pumps. You won’t have to worry about falling short, even if you go up a tank size. Pumps can be controlled on two separate channels, each with a 100-watt limit. The controller has three built-in wave programs to choose from. You can also run the pumps in an alternate order to change the current direction periodically. This gives you the freedom to customize wave patterns as much as you like. One of the best things about this controller is how user-friendly it is. Despite all the options it has, you won’t find yourself flummoxed. Time and program selection are marked clearly—all you have to do is turn the knob. LED lights will tell you that the Hydor controller is operational and the pumps are running. This controller is also discrete in terms of sound and size. It’s compact and runs quietly, which is great if your aquarium is in a quiet room. You can mount it on your tank or hang it nearby—the controller has an eyelet for this purpose. If you prefer to put it on your tank, it will stay firm, thanks to the magnetic mount. You won’t have to deal with the controller vibrating noisily or slipping out of place. Don’t be concerned about accidental water damage because the Hydor design is splash-resistant. As for pumps, we recommend either the Hydor Koralia Evolution or Hydor Koralia Nano. As with the controller, both the Evolution and Nano pumps are magnetically mounted. This allows for hassle-free adjustment inside your tank. The Nano pump can be bought as 240, 425, or 565 gallons per hour (GPH). How many you will need depends on the size of your tank and the waves you’re aiming to recreate. The Evolution pump is powerful but more energy-conservative. Models are rated from 550 GPH to 1500 GPH. You can always mix and match between the two models to find a setup that works for you. Dimensions: 7 x 1.2 x 2.8 inches. Exchange times from five seconds to six hours. Can be magnetically tank-mounted or hung up. Dimensions: 3.5 x 2 x 2 to 7 x 1.25 x 2.75 inches. Weight: 0.2 to 0.4 pounds. Dimensions: 4 x 3 x 3 to 6 x 3 x 3 inches. Magnetic mounts for easy adjustment. The controller is compatible with many pumps. The controller can be hung up or tank-mounted. Popping noise when the controller and pumps are first switched on. Don’t forget to check out the nano and evolution pumps too! The Tunze Nano Stream propeller pump is small but formidable. You can use it in aquariums ranging in size from 10 to 135 gallons. This means you won’t have to replace your pumps if you decide to expand. Despite the size of this pump, it has a powerful flow with a decent spread. One pump should be enough for most small to mid-sized aquariums. As this pump doesn’t come with a controller, it’s adjusted mechanically. You can turn the flow down low or keep it running high. You also have the ability to focus the current to a narrow area or widen it out. Best of all, the Tunze pump is energy efficient, consuming between 7 and 10 watts per hour. This is appealing whether you prioritize conserving energy or not. Who doesn’t want to save money on the electricity bills? The strainer of this pump is large enough to prevent curious fish from getting sucked into the impeller. The pump itself is magnetically mounted for fast and easy installation and repositioning. Dimensions: 3.7 x 1.5 x 2.7 inches. 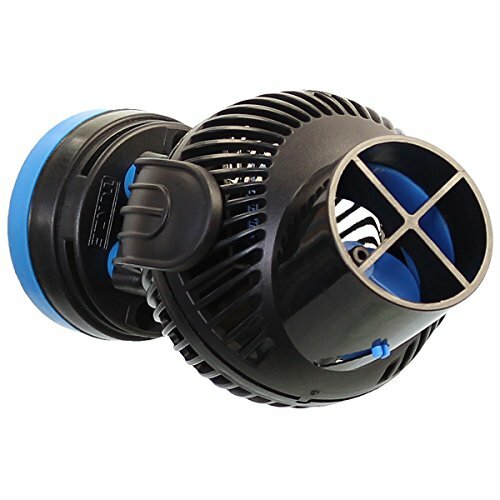 Compatible with aquariums from 10.5 to 135 gallons. Can be mounted on glass up to half an inch thick. Consumes 7 to 10 watts of electricity per hour. 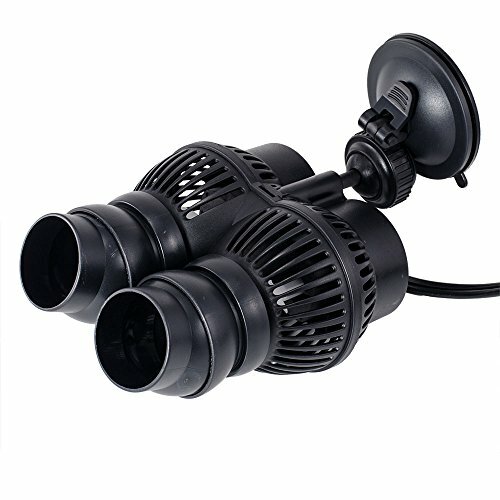 Compatible with aquariums both small and large. Can vibrate when set to stronger settings. The Jebao OW wave maker is an all-inclusive system. You will receive a controller and one pump in the package. This wave-maker offers you eight different programs to choose from. You can customize the length, speed, and type of the waves. For example, in Sine mode, waves will flow in a pattern similar to that of the Sine curve. If you aren’t keen on micro-management, you can relinquish control in random mode. Your pump or pumps will change the flow and current patterns randomly. Night mode is another program that will save you some effort. Once you enable it, water flow will automatically be reduced come nightfall. You can also lock your selected programs and shift times into place. If the controller is accidentally bumped or handled, the program won’t change. You have to long-press a button to disable lock mode. If you care for your aquarium in tandem with someone else, this setting will come in handy. There are four models of pump available with varying gallon per hour (GPH) rates. You can select from 132 to 1056 GPH all the way up to 449 to 5283 GPH. As each pump is rated for tanks ranging from 10 to 50 gallons, you can choose one or more to fit your tank. A stand-out characteristic of the Jebao wave maker is how silent it is. No matter what program you settle on, this wave maker runs noiselessly. Dimensions: 6 x 5.3 x 2.8 inches to 6.8 x 6.9 x 4.3 inches. Weight: 1.2 to 3.4 pounds. Compatible with aquariums from 10 to 50 gallons. Controller and one pump included. The controller can take some time to figure out. 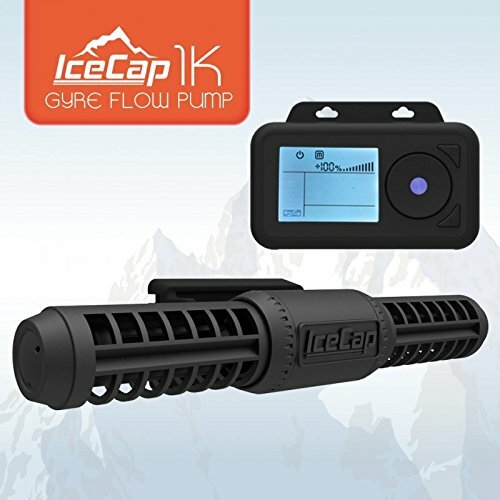 The Icecap 1K Gyre aquarium flow pump can be mounted on both glass and acrylic aquariums. It comes with a controller and a single pump and is appropriate for use with 20 to 50-gallon tanks. You’ll notice that this pump doesn’t resemble most of the products you’ve seen so far—it’s narrow and elongated, looking more like a pipe than a pump. It can be mounted either horizontally or vertically in your tank. This design is optimal for getting rid of dead spots. You won’t have to spend a lot of time repositioning and readjusting smaller pumps to get a uniform flow throughout your tank. The pump can flow in alternating directions to copy the currents of natural bodies of water. As the name suggests, this pump has a flow rate of up to 1,000 gallons per hour (GPH). If you have a smaller tank and you’re worried about too much flow, don’t be. The pump comes with a side cap so that only one side will be in operation, rather than both. The Icecap controller is a large touch screen which is straightforward to use. You can choose between five flow modes and tailor the duration of each. If you have a larger tank, you can buy the 3K model instead of the 1K. It has identical features except that it can be used in larger aquariums (from 25 to 100 gallons). Both the 1K and the 3K models come with a one-year warranty. Dimensions: 8.8 x 2.8 x 1.5 inches. Compatible with acrylic and glass up to half an inch thick. Suitable for 25 to 50-gallon tanks. Compatible with glass or acrylic aquariums. Strong cross flow that eliminates dead spots. Easy to adjust and install. Arrows to switch modes on the controller can be difficult to tell apart. Even the lowest flow setting is quite strong. The SONGJOY wave maker line consists of discrete pumps that can work in aquariums as well as ponds and pools. The pump features dual heads to promote an even water flow in your tank. Regardless of what size tank you have, there is a model that will fit. Songjoy produces wave makers with flow rates as low as 660 GPH to as high as 3170 GPH. You can find a pump designed for tanks from two feet up to eight feet in length. Installing and adjusting your chosen pump won’t be a challenge. The mount is magnetic and works with any type of tank material and thickness. The shaft of a SONGJOY pump is made from ceramic. This erases any concerns you might have about future corrosion. With the spindle, you can rotate your pump 360 degrees for optimal flow. Don’t be deceived by the petite size of these pumps: the propellers are far from weak. Despite this, SONGJOY pumps operate quietly without any irritating noises or vibrations. Dimensions: 2.7 x 2.7 x 3.5 to 6.2 x 3.2 x 3.9 inches. Weight: 7.8 ounces to 1.5 pounds. 660 to 3170 gallons per hour (GPH). Suitable for tanks from two feet to eight feet long. A range of pumps to choose from. Compatible with tanks of almost any thickness and material. No controller or program choices. It’s possible very small fish and aquatic life can get trapped in the impeller. The SUNSUN wave maker is a no-nonsense wave maker that packs a punch. It has a flow rate of 1600 GPH yet is energy-saving, consuming just twelve watts per hour. If you have fish that thrive in strong currents, this wave maker will do the job. The power generated by the SUNSUN pump will keep them active and moving. This pump is also perfect if you’re looking to keep your tank clean. Any waste trapped in your substrate will almost certainly be blown out. The force of this pump will also reduce the likelihood of dead spots forming in your tank. This pump will run quietly and unobtrusively. The only sign that it’s functioning will be the movement of water in your tank. The pump head is affixed to a ball joint so you can adjust it 360 degrees. Due to the strength of the current, this model is terrific for keeping your substrate clean. Solid waste like uneaten fish food and feces will be blown right into your filter. Dimensions: 5 x 5 x 3 inches. Flexible ball joint for easy adjustment. Even water movement and temperature. Suction cup mount weakens over time. Too strong for small tanks. Short cord at 4.5 foot. 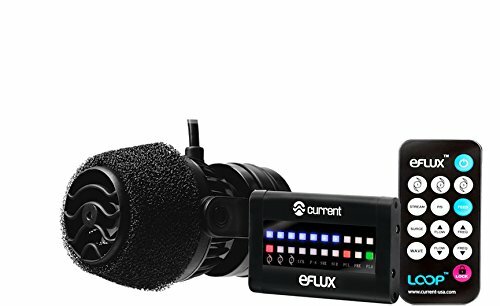 The Current USA eFlux wave pump kit includes everything you could possibly want in a wave maker. There are three models available, appropriate for tanks from 55 to 125 gallons. You can also pick between a 660, 1050, or 2100 GPH rating. If you’re a fan of high-tech aquarium equipment, you’ll enjoy this wave maker. The controller can be operated wirelessly with remote control and is capable of managing up to three pumps. This wave-maker has three modes of operation: stream, surge, and wave. You can control the flow (strength) of each. You can program your pumps to run separately from one another. This allows you to choose multiple flow programs and run them simultaneously. If you’re looking for a realistic pattern of water movement, this is very helpful. An added benefit is that both the pumps and controller are quiet. All the pumps can be pivoted to ensure the water flow stays even. As the pumps are magnetically mounted, adjusting them won’t be tedious. The controller and hub can be mounted just as easily. Dimensions 6.3 x 5.7 x 3.7 inches. From 55 to 125 gallon aquariums. For tanks 0.01 to 0.5 inches thick. Works with up to three pumps. Micro USB and ER sensor cables. LED lights are pleasant to look at. Lots of wires—can be unsightly. There are a lot of advantages to introducing a wave maker to your aquarium, and as you can see, there are models to suit aquariums and preferences of all sorts. If you have any questions or feedback, please leave a comment below, We will be sure to answer every one!